ACTV Line T1 provides frequent, cheap service from the mainland district of Mestre to Venice's Piazzale Roma. ABOVE: A T1 tram arrives at Piazzale Roma, the transportation gateway to Venice's historic center. Hotels in Mestre tend to be cheaper than hotels in Venice's historic center. Mestre is car-friendly, which means you can park at your hotel and commute into the city center by public transportation. Until recently, the most convenient ways to reach Venice from Mestre were by train (see our "Mestre to Venice by Train" article) or by ACTV city buses. 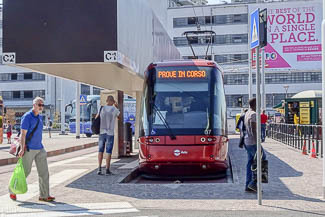 The tram is convenient if you're staying at a hotel near the section of the T1 (red) line between the Piazzale Cialdini and Forte Marghera, which runs mostly along a major street called the Via San Marco. Click here for hotel listings. Note: If you purchase an ACTV Travel Card for Venice's expensive water buses, you can also use it for trips on the tram. To ride the tram, board via any set of doors and immediately hold your ticket against the nearest electronic reader until you see a green light flash and hear a "beep." Be sure to do this, since you can be fined heavily for riding without a validated ticket. 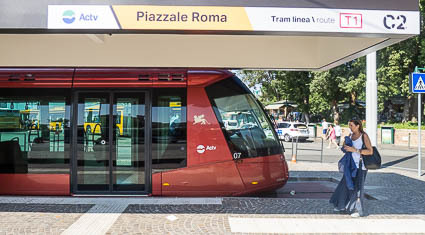 ABOVE: A T1 tram waits in the Piazzale Roma station. (The newsstand on the right side of the photo sells tram and bus tickets.) Trams in Venice and Mestre are rubber-tired, with a single guiderail embedded in the pavement. 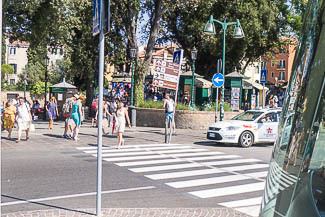 ABOVE: From the tram platform in Piazzale Roma, a zebra crossing leads to a stone footbridge. Cross the footbridge, and you'll be in Venice's centro storico or historic center.